Megaloceros is an extinct genus of deers that lived in Eurasia between the late Pliocene epoch and the late Pleistocene epoch, between about 2 million and 11,000 years ago. The best known species of the genus is Megaloceros giganteus which is popularly known as the "Irish Elk". 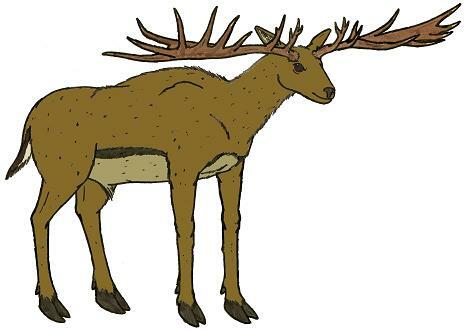 For the most part Megaloceros were large animals, for example Megaloceros giganteus was nearly 7 feet (2.1 meters) tall at the shoulder, and had antlers that were as much as 12 feet (3.7 meters) from tip to tip. There were however some smaller species of Megaloceros, and in particular species living in Mediterranean islands such as Corsica and Sardinia were prone to dwarfism, and stood less than 3 feet (1 meter) tall at the shoulder.